Sell your home with a rhinorealty Owner Participation Package and save thousands in real estate commissions. 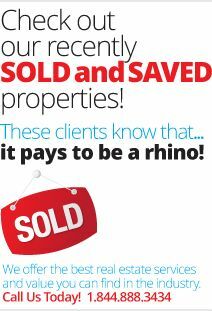 Learn how to sell the rhino way with a FREE no obligation In-Home visit. There’s never an obligation to buy! One of our local licensed REALTORS® will visit your home to explain the Owner Participation process, and what you can expect throughout the course of your listing. They’ll also be happy to answer any questions you might have. You’ll learn the advantages choosing to add an MLS® Listing and a REALTOR® Key Lockbox to your Owner Participation Package. Additionally, your rhinoagent will explain the benefits of signing up for rhinorealty’s signature contract assistance tool, NegotiAid®. Your rhinoagent will also explain, in detail, how the MLS® System works, and how to deal with cooperating buyer’s agents should you chose to offer compensation to those agents. And remember not all companies that offer this type of service send a licensed REALTOR® to your home. They may only send a “marketing consultant”. Don’t short change yourself, learn from a professional!